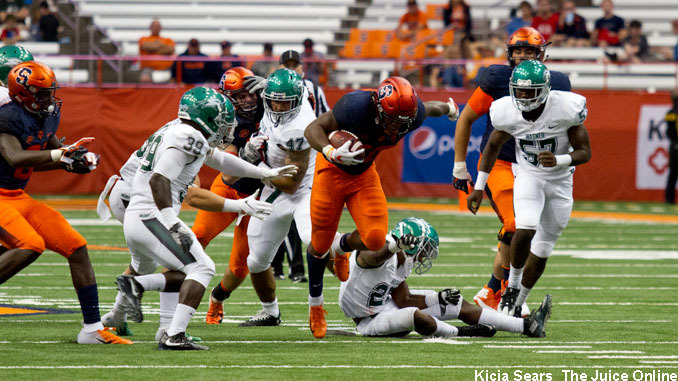 Syracuse plays against Wagner. Mandatory Photo Credit: Kicia Sears, The Juice Online. Three-star Florida safety Cornelius Nunn decommitted from Syracuse on Sunday night, he announced via Twitter. Nunn had chosen Syracuse over the summer over other offers from higher profile programs which included Alabama, Georgia, Auburn, and what appears to now be his front runner, Miami. Nunn was on the Syracuse campus to watch the Orange defeat Florida State in September, but announced his decision to go a different direction the day after SU lost to Pitt. Michael Carmody, a 2020 four-star offensive lineman for Mars (Pa.) tweeted that he had received an offer from the Orange over the weekend. He holds offers from a variety of schools including Michigan, Penn State and Virginia Tech. He holds 16 offers according to 247 Sports. On the basketball front, 2019 SU basketball commit Brycen Goodine has scheduled his official visit to Syracuse. It will be on the weekend of Oct. 20, which happens to be the same weekend that 6-foot-9 forward Akok Akok from Putnam (Conn.) Science Academy is going to be visiting, according to Syracuse.com’s Mike Waters. Among the other schools Akok is considering include Providence, Georgetown, Connecticut and Pittsburgh. He visited Georgetown over the past weekend and told Adam Zagoria from Zagsblog.com that he had a “great weekend” with the Hoyas. Another 2019 prospect that will be making a decision soon is Joseph Girard III. Syracuse coaches Jim Boehiem and Gerry McNamara visited with Girard in Glens Falls last week ahead of his decision later this week. The Daily Orange’s Anthony Dabbundo caught up with Girard as he went through his decision process. Aside from the Orange, Girard will be considering Penn State, Notre Dame, Boston College, Duke, Michigan. Another 2019 prospect that Syracuse is heavily pursuing is Canadian wing Quincy Guerrier. He took a visit to Illinois this weekend, and told Zagoria that the visit went great and he was told he would “play right away.” Aside from Illinois and Syracuse, Guerrier is considering Oregon. That’s all for today. Hope you enjoyed your long Holiday weekend.